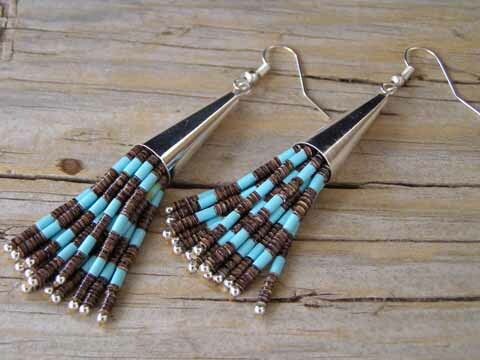 These combination Kingman turquoise and baby olive shell fine-diameter heishi earrings symbolize the tassels on a corn plant (see photo above). Happily, Frank has taken artistic license to fill these out and make them "richer" than actual corn tassels in creating this homage. Each earring, in fact, has fifteen separate wisps of fine-diameter Kingman turquoise and baby olive shell heishi dangling from the Sterling cones and is tipped by a tiny Sterling bead that looks like a dewdrop. Free-swinging on Sterling hooks.